Still have a bit of painting, but the framing, siding and trim are complete. Porch is now the storage area for the remaining siding. 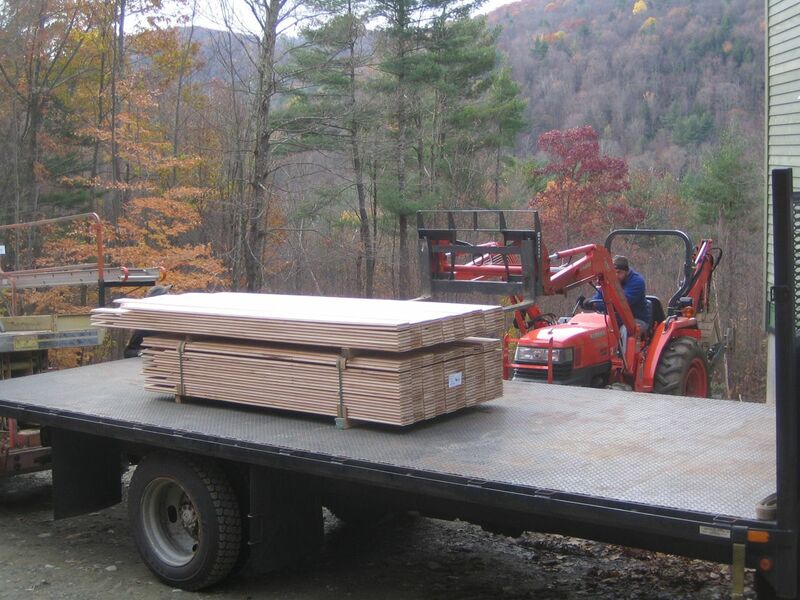 Metal roof materials for the porch and roofets should arrive next week. 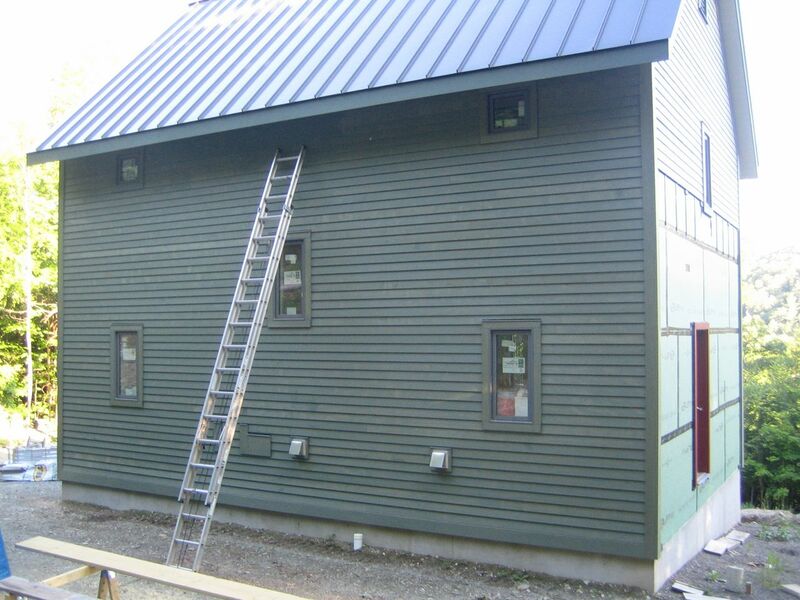 Getting the remaining metal roofs finished is high priority because it’s holding up completing the siding work and, believe it or not, the leach field. We are using a scissor lift to install the siding and roofs and it’s too heavy to drive over the leach field, so we have to finish at least the south side before we can install the leach field. In the mean time we paint siding, a lot. All weekend, every weekend. 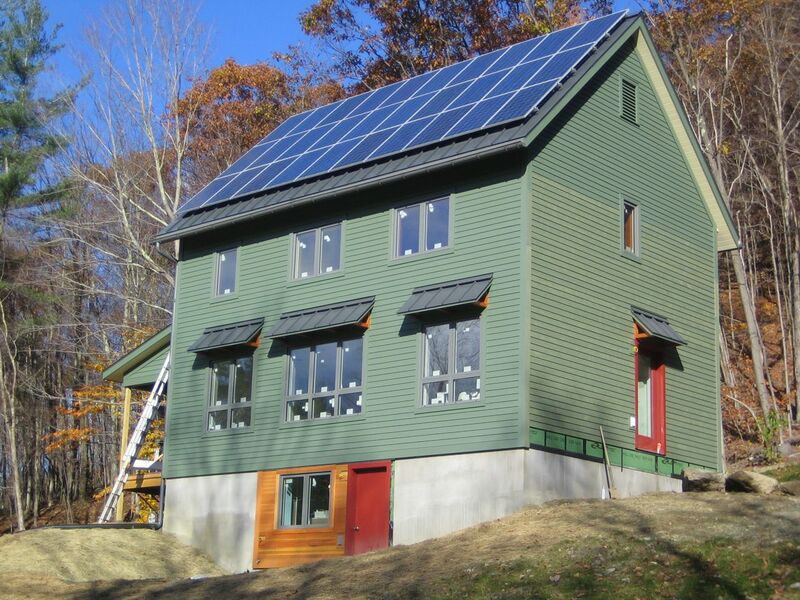 I’m also trying to find someone to install gutters, 6″ half rounds, aluminum in Tuxedo Gray, with 4″ downspouts. We’re also hoping to start the sheetrock on the second floor ceiling soon so we can do our first blower door test sometime in early September. 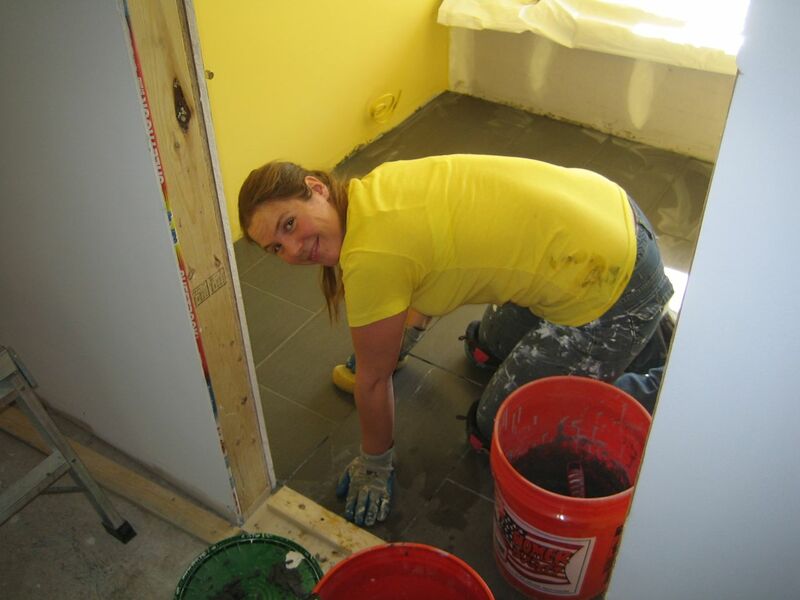 Jill and I took several days of vacation last week to help Warren with the siding. 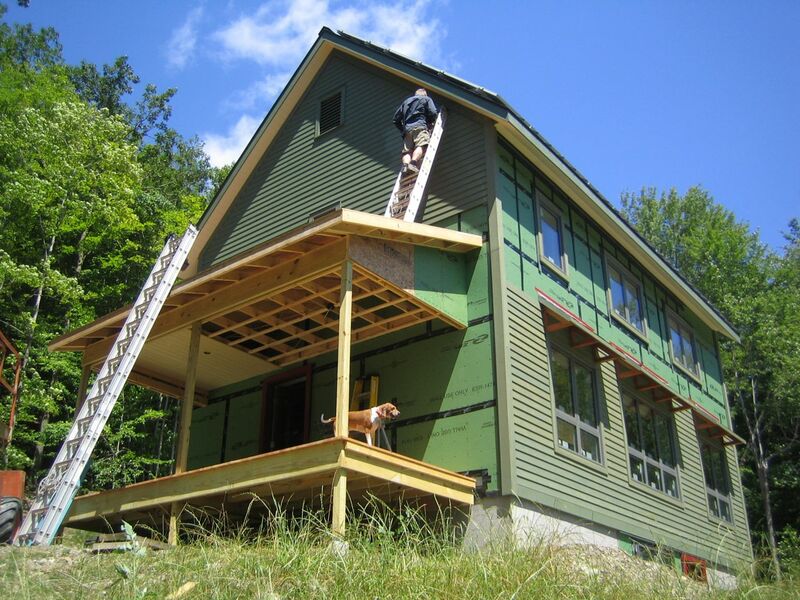 In five days, we finished siding and painting the north side of the house and we installed the roofets / sun shades for the 1st floor south facing windows (‘awning’ sounds so 60’s no?). The roofets will get a metal roof covering like the main roof. 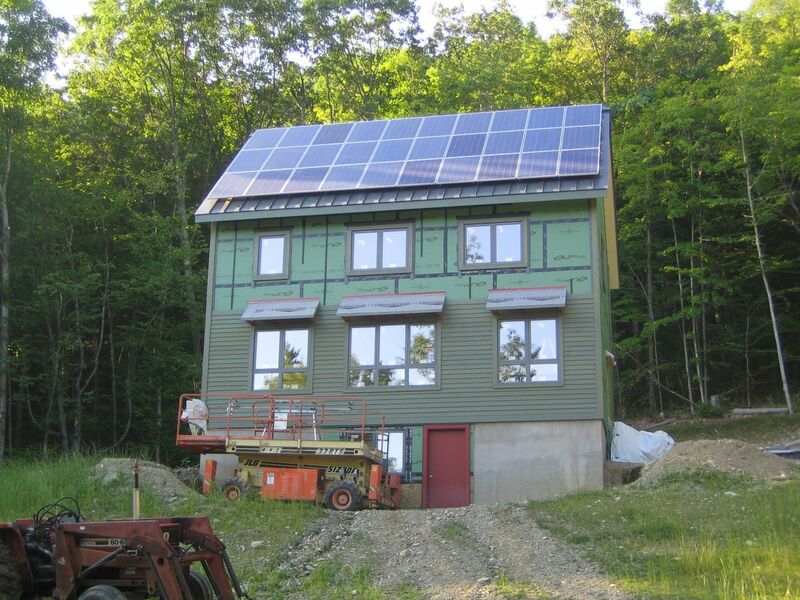 We’ll finish the roofets when we install the metal roof over the porch. Just wanted to share a few pics of the siding to date. We’ve finished half of the west gable end, half the south side and half the north side. There is a crazy logic to all the skipping around but I will spare the details for once. We’re planning to finish the north side before deciding what’s next. 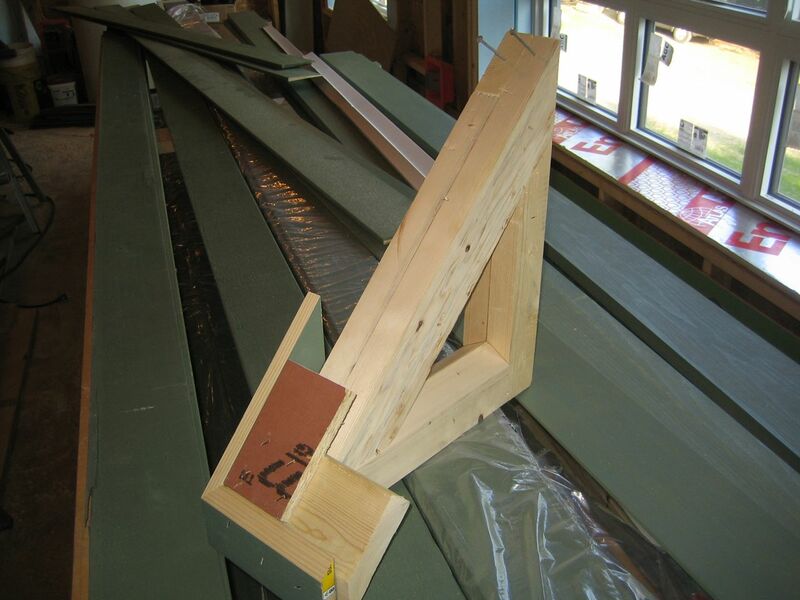 Warren made a great mockup of the brackets we will use for the ‘roofets’ (small shade roofs for the south facing 1st floor windows). 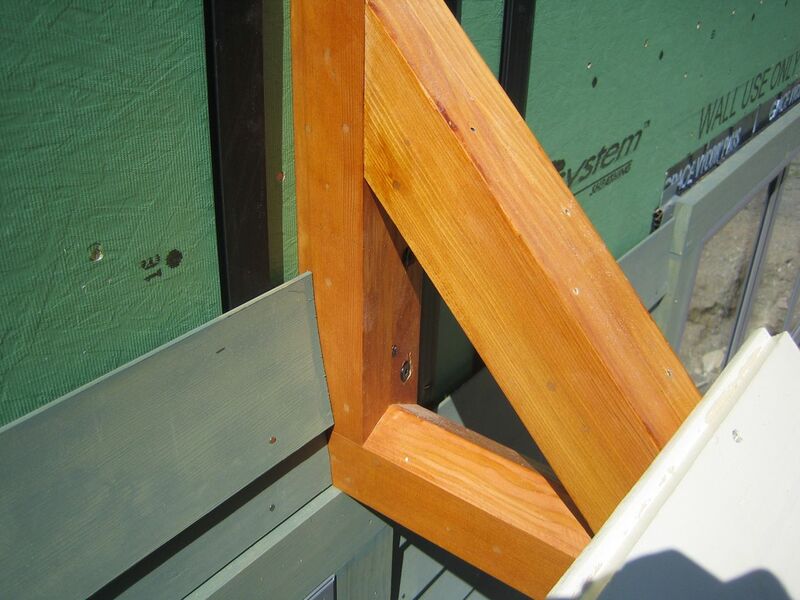 The actual brackets will be made from Douglas Fir. We will have to frame out the roofets and add the metal roof before we can continue with that side. 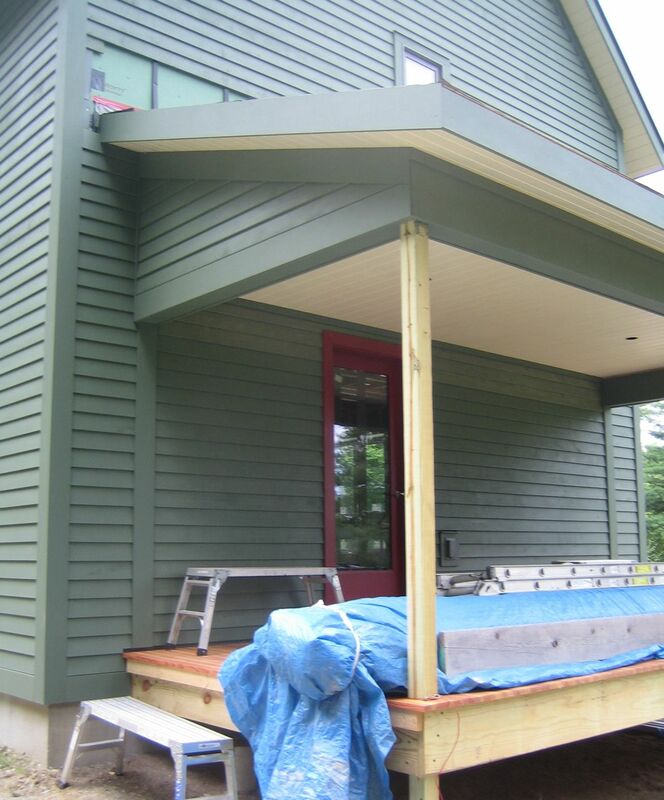 On the west gable end, we have to frame out the porch before completing the siding there. Same for the east gable end. 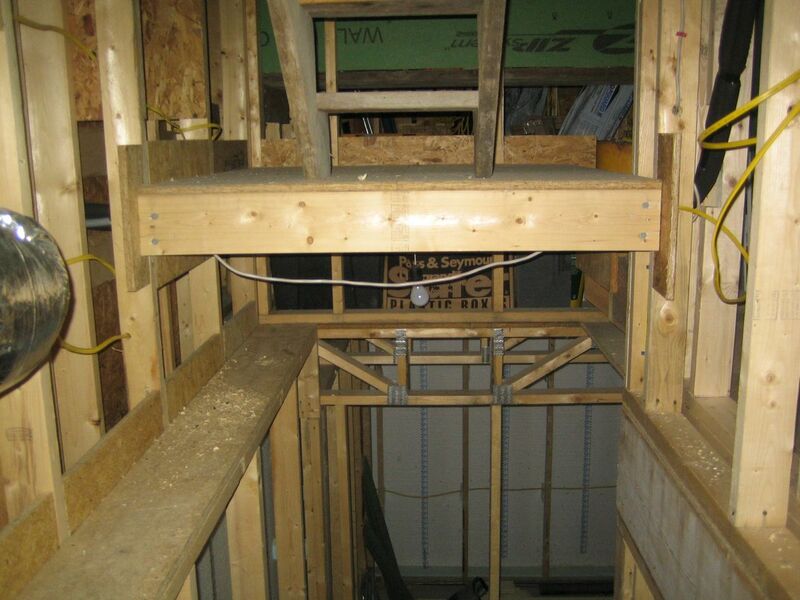 We have a small entry porch that needs to be attached with it’s own roofet before that side can begin. 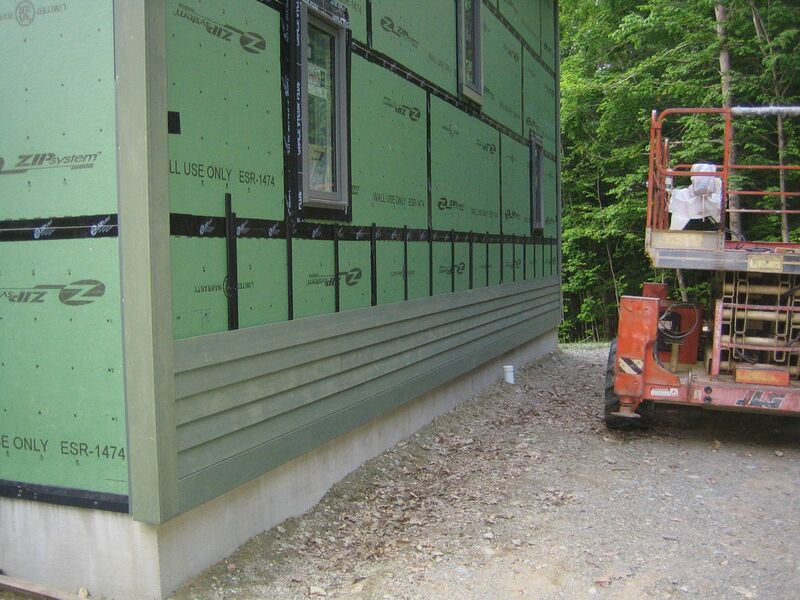 The weather report appeared to be clear for a few days in row last week so we decided it was time to start the siding. The first day was half sunny and half stormy with a brief spat of hail. This was the same storm that spawned tornadoes in Massachusetts. 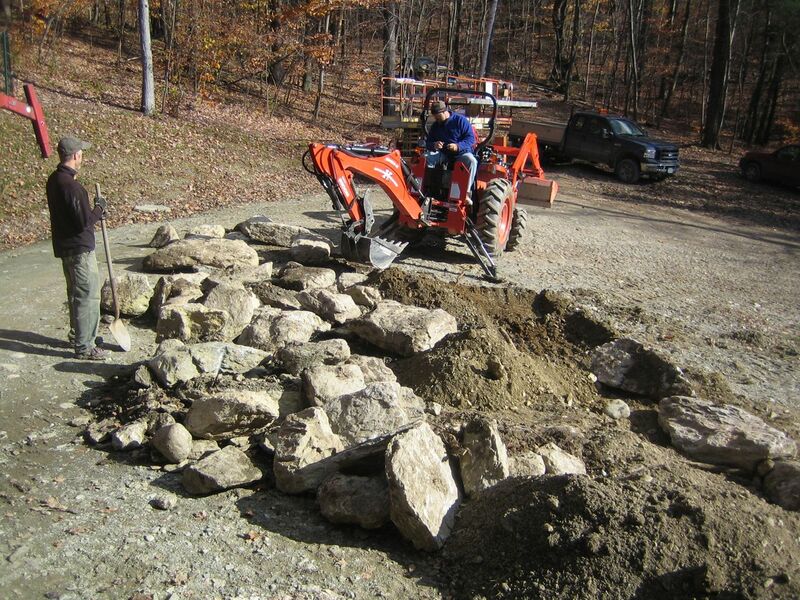 Despite this initial setback, we were able to work steadily the last few days. 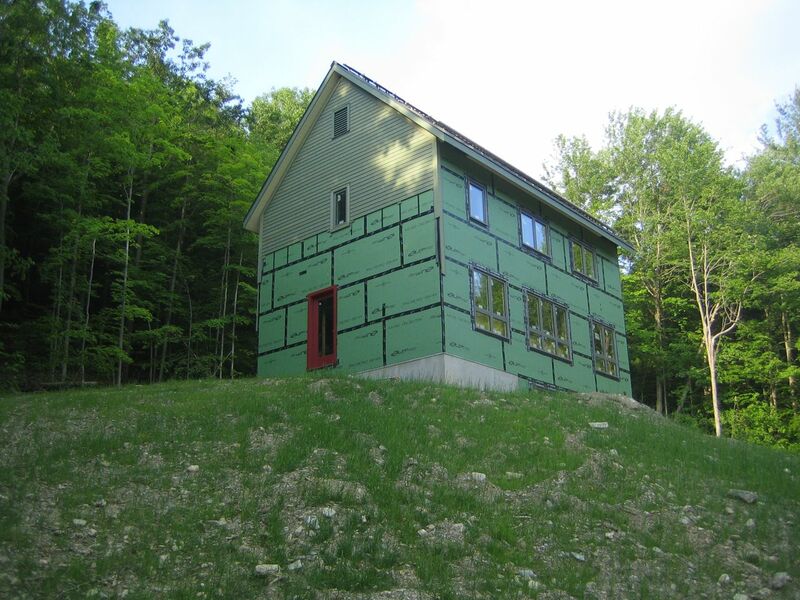 We looked at a few different siding materials when we started the project. 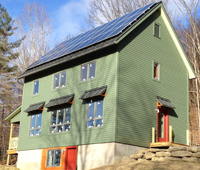 Affordability was a big factor, but so was sustainability and durability. 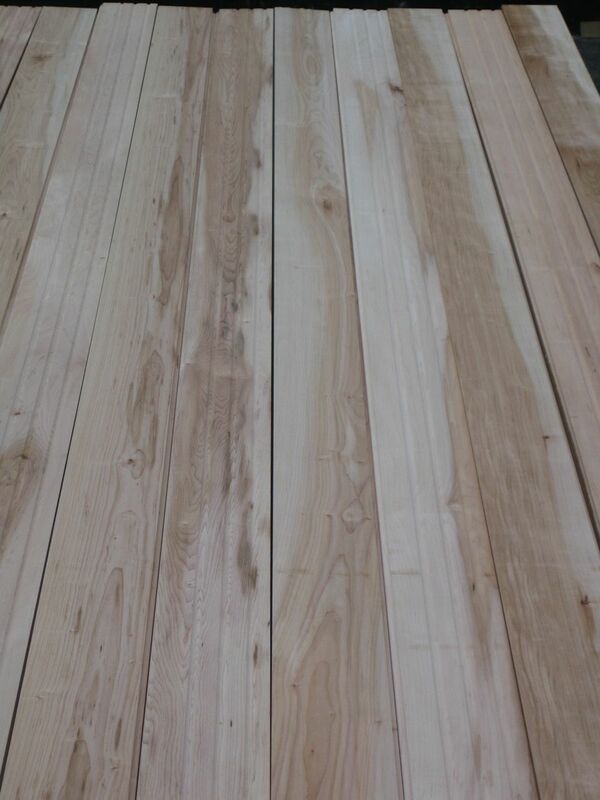 Cedar is the most durable natural product but also very expensive. 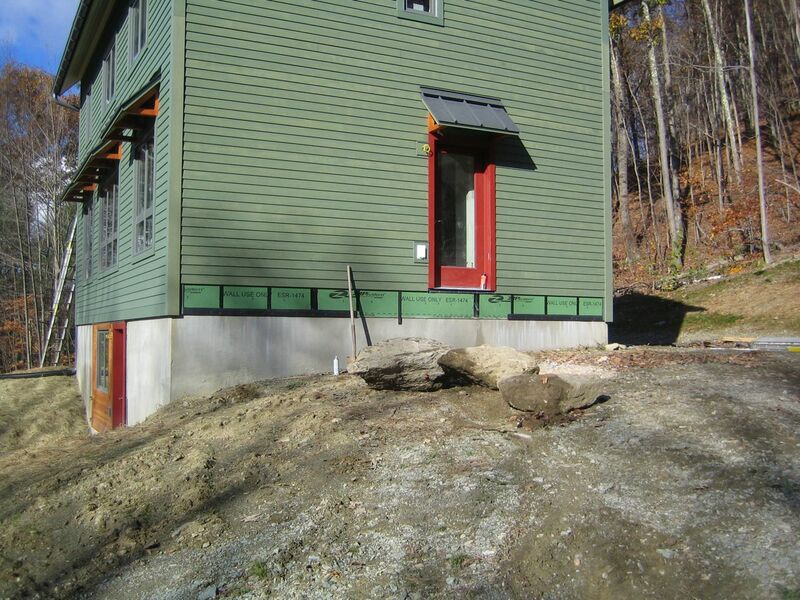 We rejected fiber cement because we just didn’t like the look and it seemed out of place in our woodsy setting. Vinyl looks cheap and it is certainly not an environmentally friendly product. 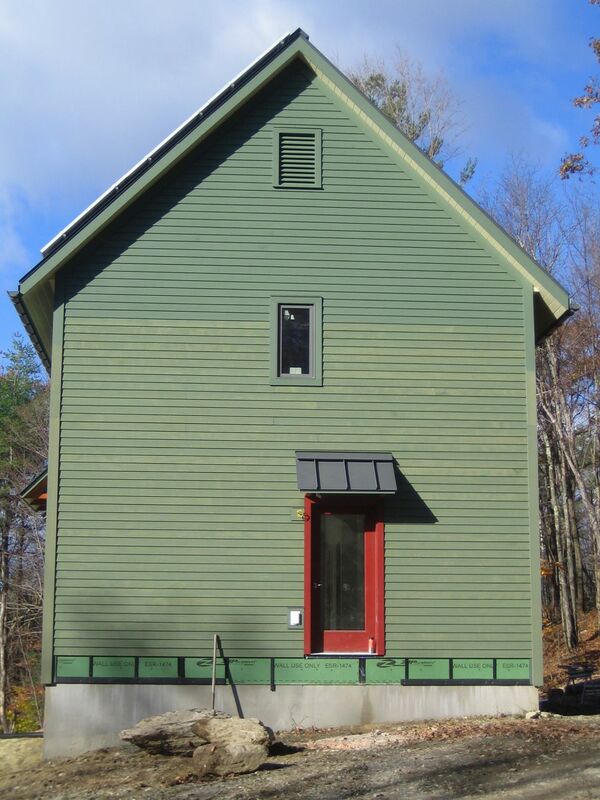 We settled on hemlock wood siding. 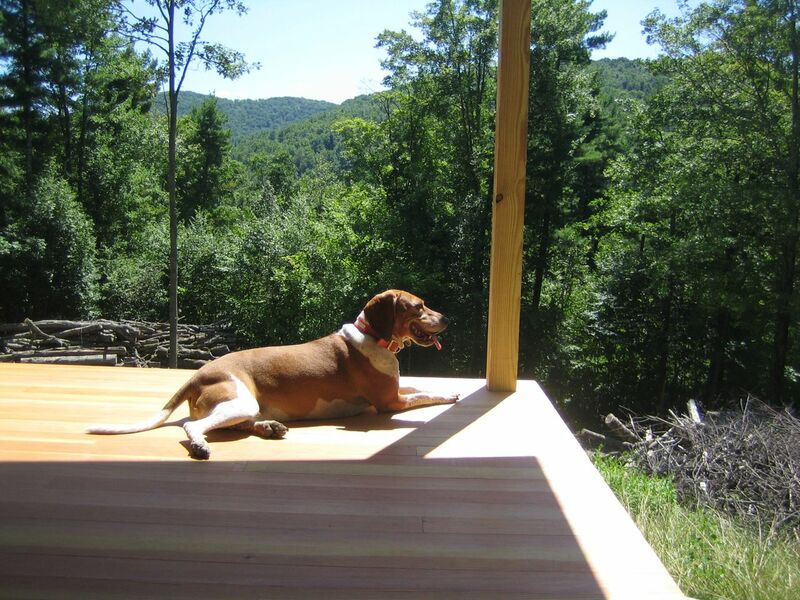 It is durable, looks good and is cheaper than cedar. It is factory stained with one coat of Cabot’s (Thicket solid) water-soluble stain. 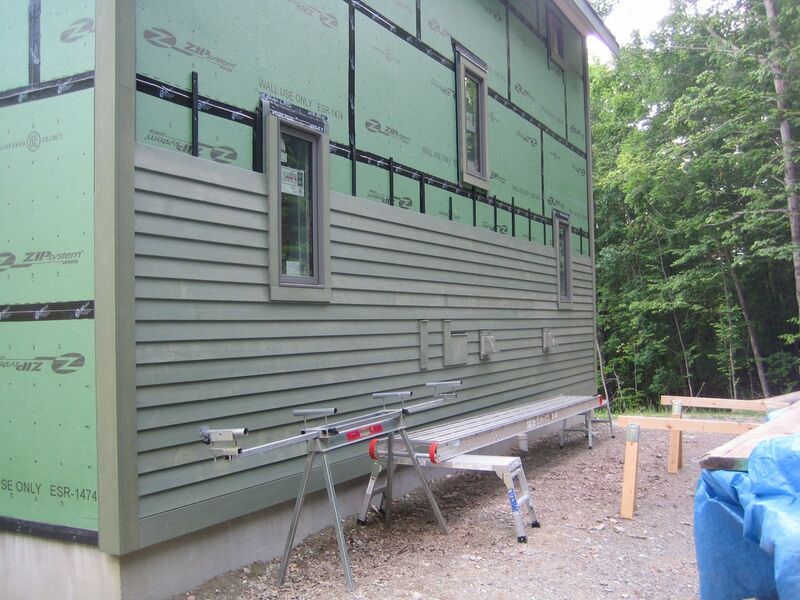 We are installing the siding over 3/8″ Sturdi-Strips furring and 7/16″ screened Cor-a-Vents at the top and bottom of the wall and above windows and doors. 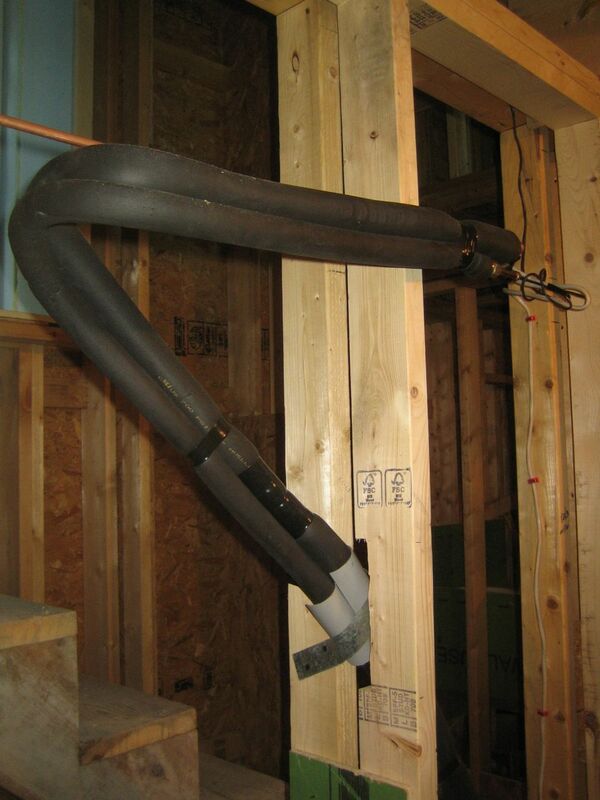 This provides a space behind the siding for air to circulate and aid in the drying process. 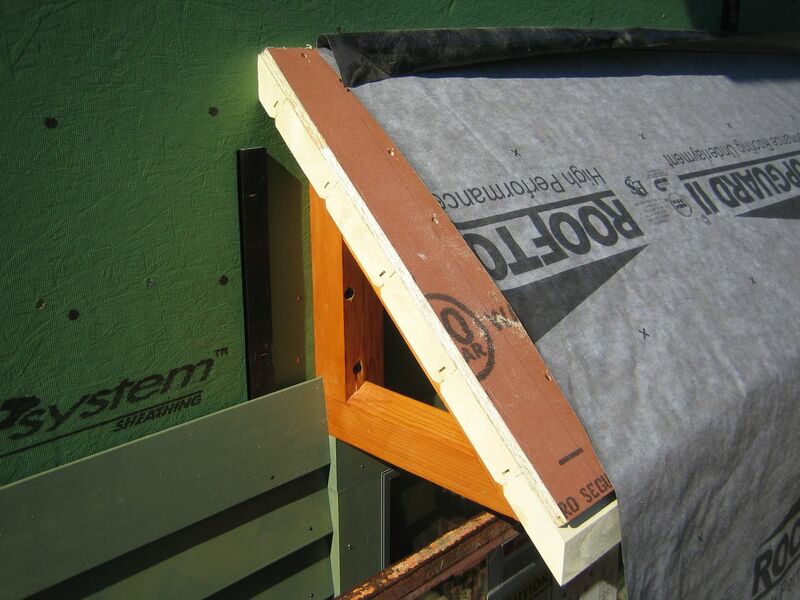 We’re using this rain screen approach because the ZIP panels are OSB and we have 12″ of cellulose next to it. OSB and cellulose perform best if they can dry easily. We want to make sure they can dry as easily as possible. 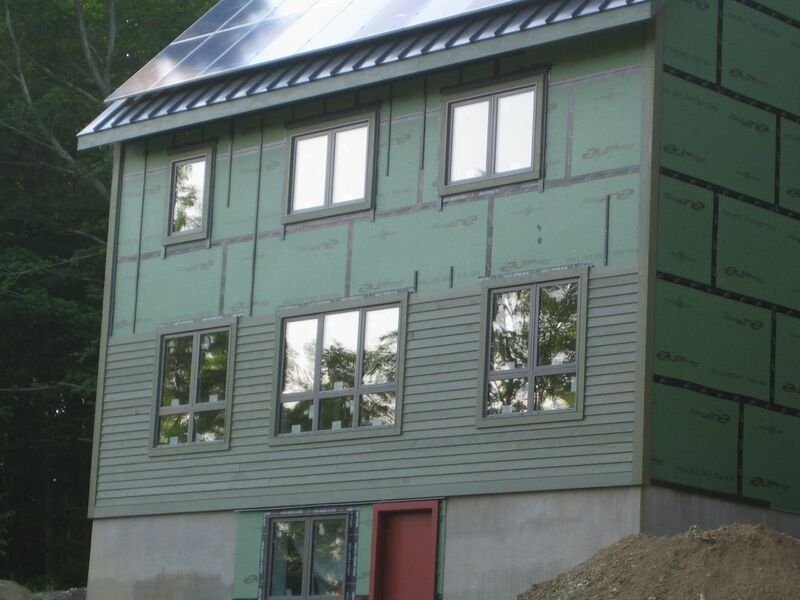 We’re using metal flashing at any location water has a direct path to the wall, anytime siding meets trim, frieze or baseboard and between lengths of siding. 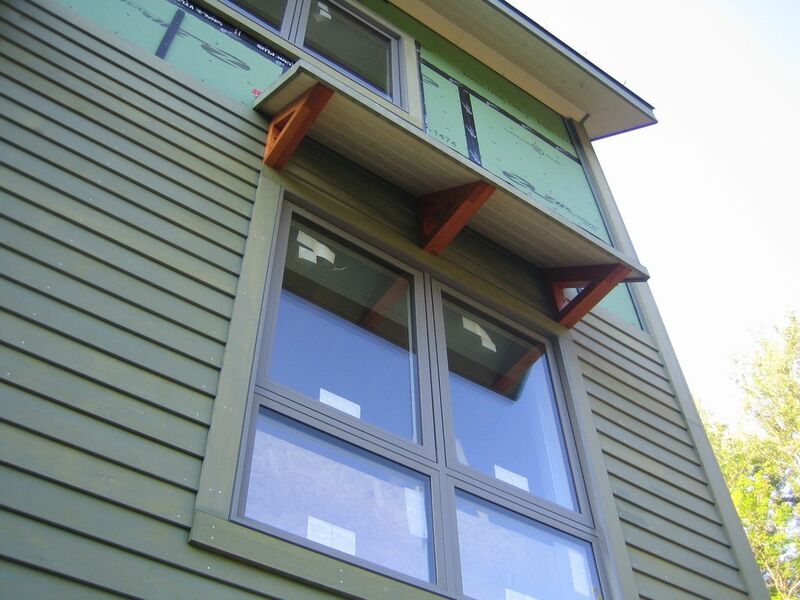 All siding and trim is attached with stainless nails. Here’s some snapshots with descriptions of the details. 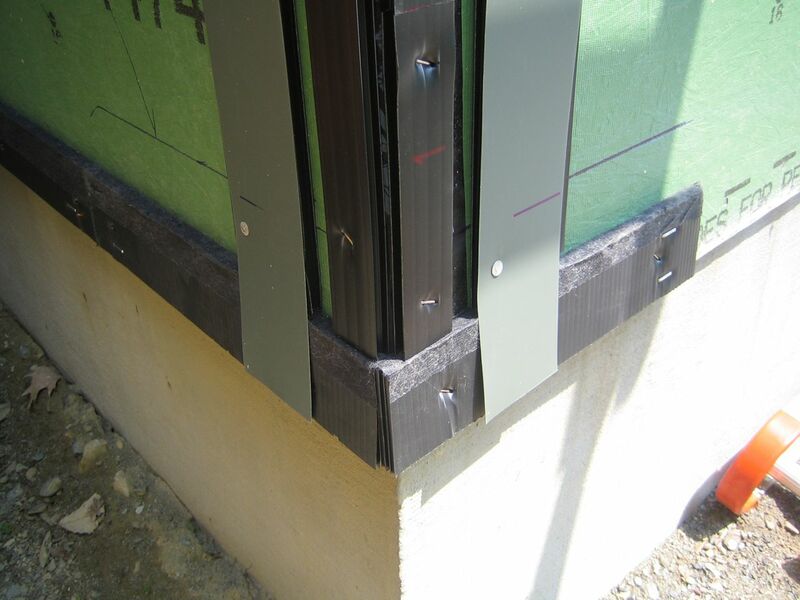 We wrapped the window with furring strips then nailed flashing on the outside edges on top of the furring. Window trim was then installed over furring and flashing. 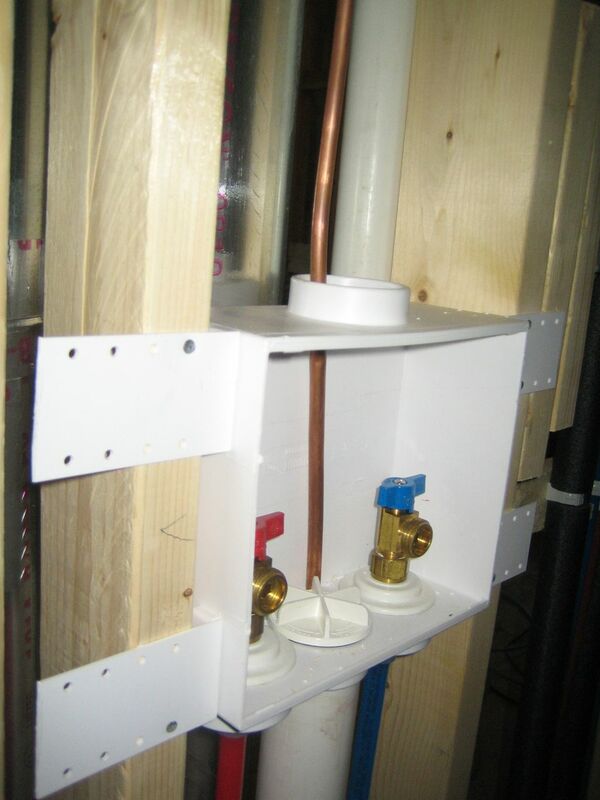 Drip cap on top was taped to sheathing using Zip tape. 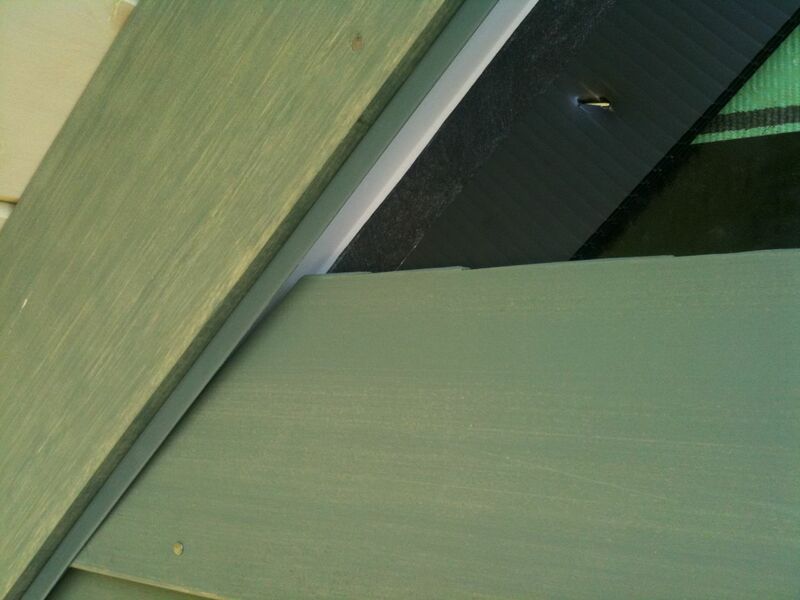 Cor-a-Vent was nailed over drip cap, then the siding was notched 3/8″ over the drip cap to allow for drainage and air flow. Frieze plate is nailed over furring. We forgot to notch the frieze trim plate before we nailed the furring and frieze, so we custom folded a J-channel below it. 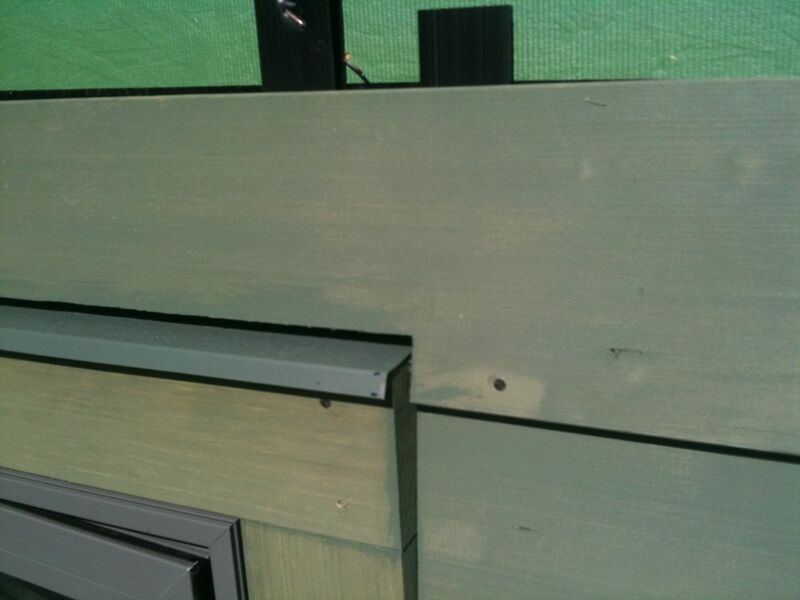 This detail prevents insects from getting under the frieze and shields rain from directly entering the gap. 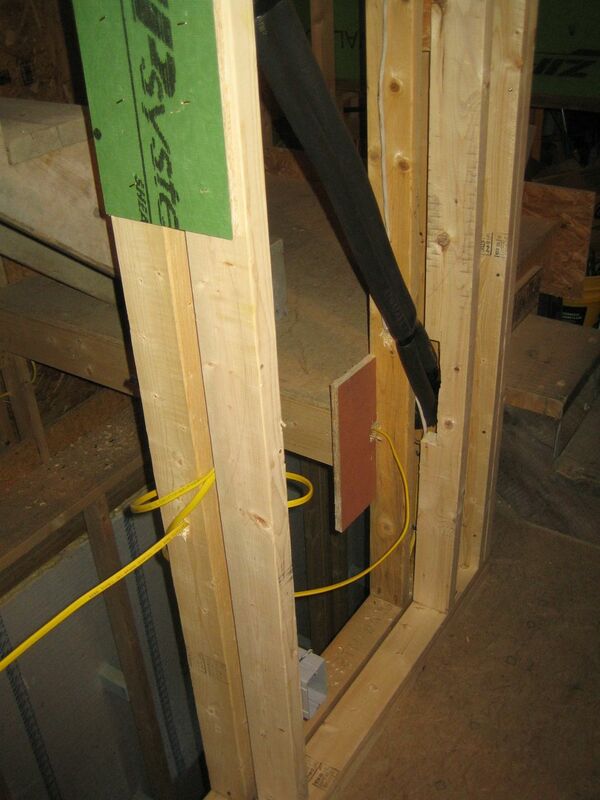 We then nailed Cor-a-Vent strips over the bottom edge of the J-channel, then slid the siding into the channel, with a 1/4″ gap at the gable edge for air circulation. We’ll notch the frieze plate for the other gable end so we don’t have to use the J-channel flashing detail. Two strips of furring at the edge, and two more offset from the edge to support nailing of the corner trim, then flashing over the furring. Screened Cor-a-Vent at the bottom for air circulation. Corner trim is nailed over this, then base trim is nailed over the Cor-a-Vent. You can see the flashing behind the corner trim. 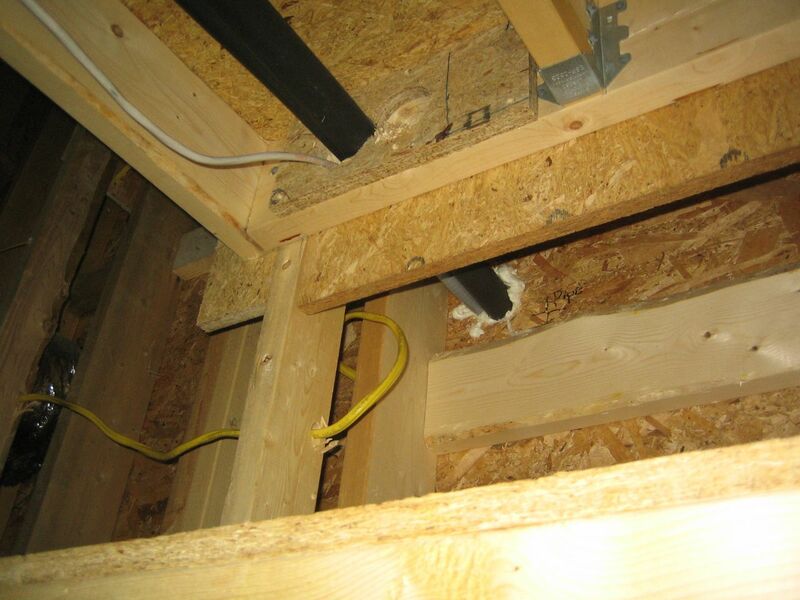 The base and corner trim extends about a 1/2″ below the bottom of the sheathing. 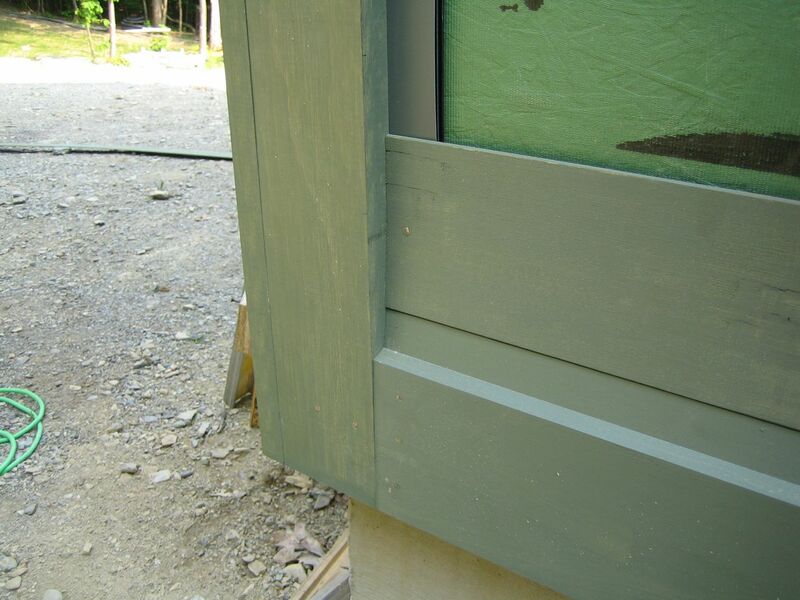 The base trim is notched to accept the fist layer of siding. 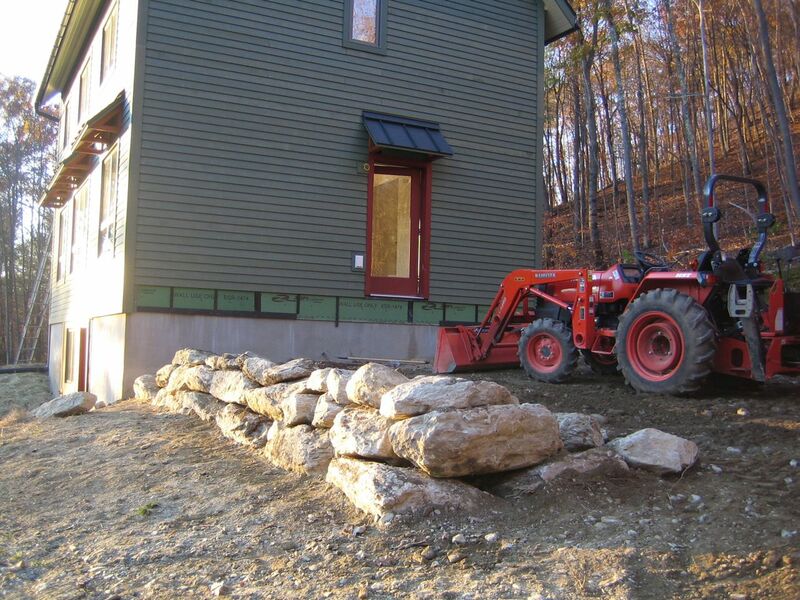 The layer of siding above the base will be hidden by the first two courses of siding. The first 5 courses of siding up on the north side of the house. 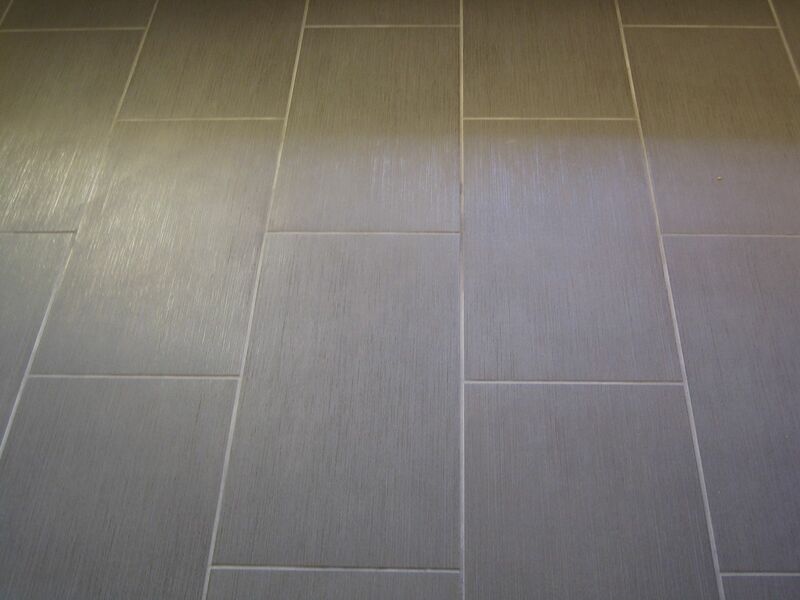 You can see the vertical furring strips spaced at 24″ on center. 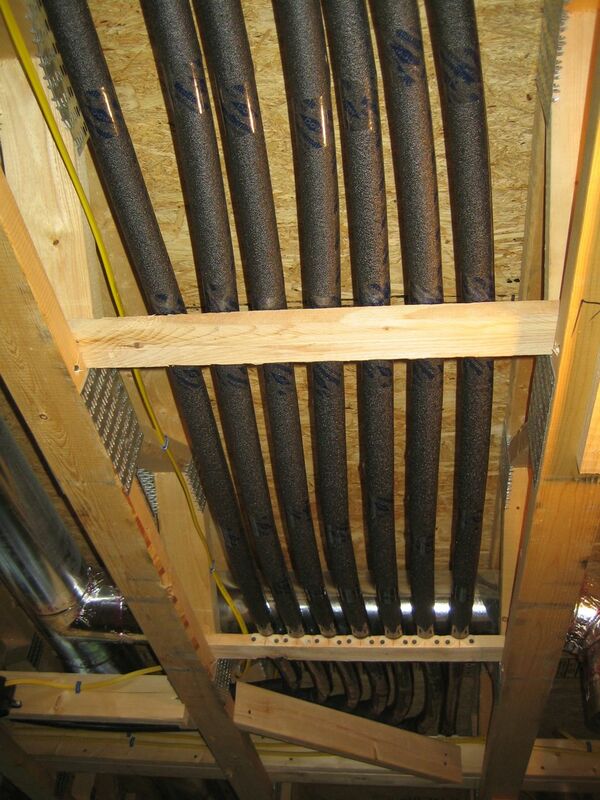 We’ll pause here until the ventilation ducts are installed 4 feet above finish grade. 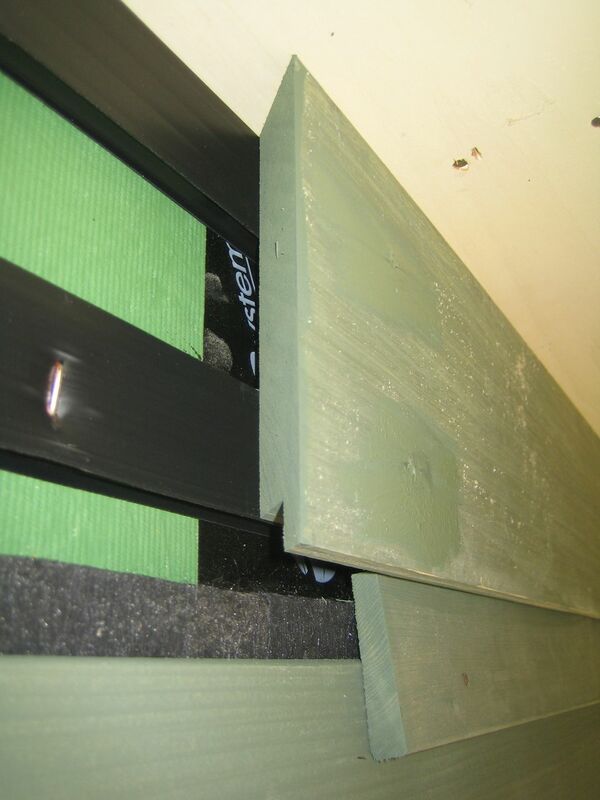 Then we’ll continue the siding around the vent in/out-takes. 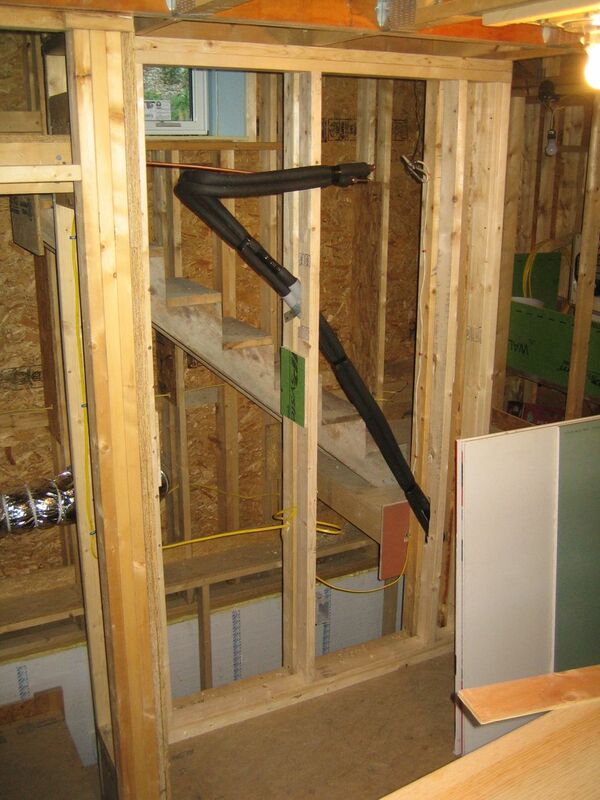 The outdoor unit of the ASHP will also be installed on this wall with brackets. 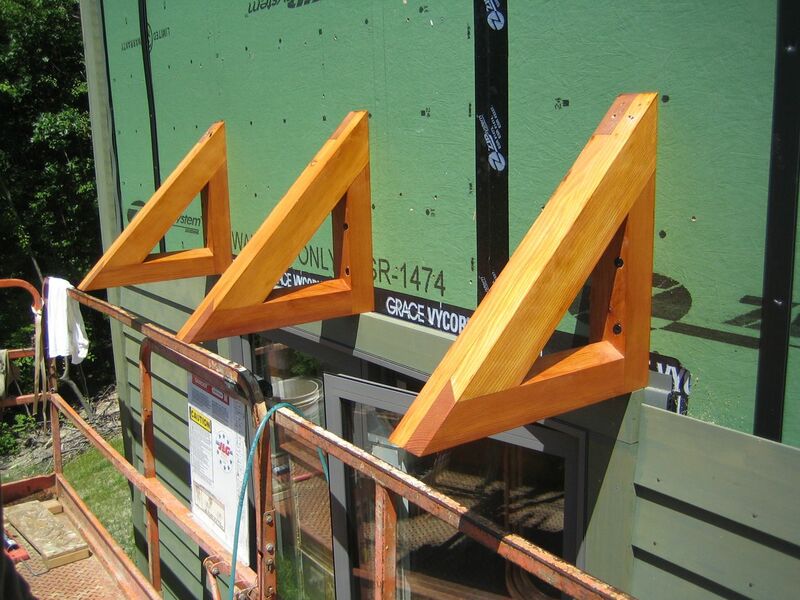 Then we’ll figure out how to install the siding around the brackets. 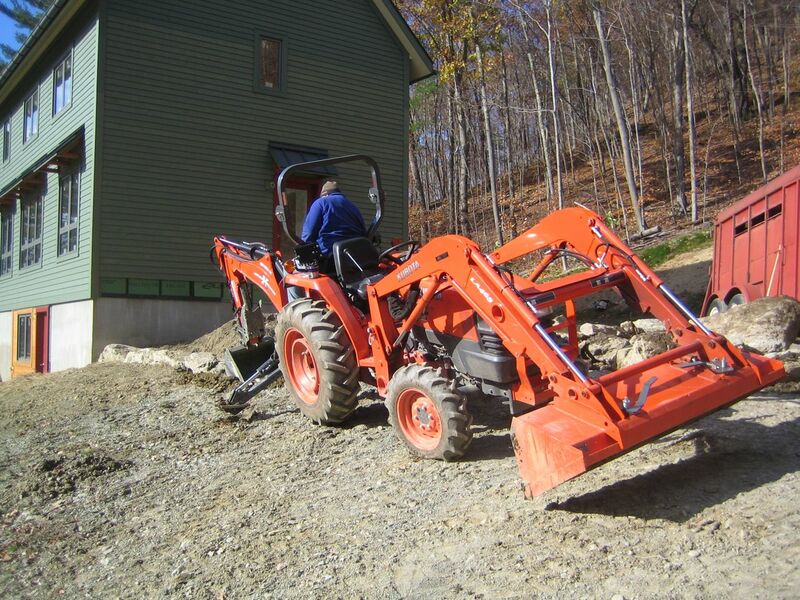 I took a few days off to help Warren get started with the siding. Just wanted to post a quick photo to show our progress. I’ll update with more details later this week.